Now wait, I say, now wait a minute there sister! You're here, I say, you're here at the heart of a website devoted to that Looney Tunes character Foghorn Leghorn and his various co-stars. 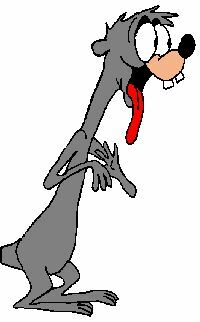 This loud-mouthed practical jokester first appeared as a guest character for Henery Hawk in Robert McKimson's 1946 Warner Bros cartoon Walky Talky Hawky. 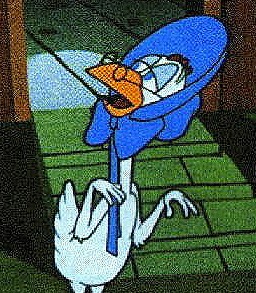 Foggy proved to be a hit on his own right and went on to star in almost 30 Looney Tunes and Merrie Melodie cartoons. In addition to his booming voice and a collection of signature phrases, Foghorn Leghorn is perhaps best known for the various entanglements he got into with a number of recurring characters. 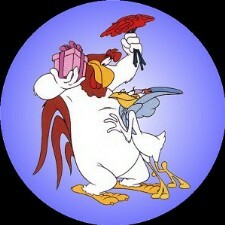 In addition to Henery, these most often included Barnyard Dawg, Miss Prissy, her son Egghead Jr and a unnamed weasel. You'll find information about these costars here too. You'll note the menu to the left or at the bottom which takes you to the other web pages here at One Foggy Site. You Foghorn fans will also want to check out the webring and barnyard pages for more Foggy stuff. Anyway, thanks for dropping by and I hope you enjoy your stay. Comments are welcome. So until next time: Adios you chicken-pluckin' little stinkar! Learn all about the people and music which make this cartoon such a masterpiece! Here's a new Looney Tunes Site for the serious fan: Hidden Looney Tunes Gags. It's got images and sound files highlighting some of the clever jokes the WB animators hid in their cartoons. One Foggy Site is now featured in the Yahoo! and dmoz web directories. Select the logos above to see where it's listed! Sign My Guestbook.� View My Guestbook. The copyrights to Looney Tunes characters are not owned by me and there is no commercial intent regarding the data presented here. It is merely an expression of enthusiasm by a fan.